Between the four main carriers and numerous tier-two operators in the UK, we're spoilt for choice when it comes to picking a mobile network. And yet, we've now got another new player to consider that does things a little differently. FreedomPop's mobile service launched towards the end of September (it's already established in the US), with its main attraction being a completely free, barebones tariff. Though it sounds too good to be true, the "Basic 200" plan gives you 200 minutes, 200 texts and 200MB of 4G data each month, gratis. So... what's the catch? Well, there isn't one really, as long as you stay within those allowances. FreedomPop does intend to make money, of course, through overage charges, value-added services and its paid SIM-only plans. While many of you may well be awaiting delivery of a FreedomPop SIM, I managed to take the service for a test drive last week, and this is how I fared. To set the scene, I've had the same phone number for close to 15 years, so it was impossible for me to ditch my primary phone and go in-all on FreedomPop. Instead I tried to replicate what, for me, would be a typical week of usage. That meant turning off WiFi on the Galaxy S4 the FreedomPop SIM was paired with, and using the handset for calls and data as if it were my own. I discovered that I don't spend nearly as much time glued to my phone as I thought. Like many of you, I'm sat in front of a computer for the majority of the day, meaning I don't turn to my phone for browsing, emailing and social networking needs during that period. I also don't make a great number of calls, and over the course of the week, a couple of brief work-related chats and a quick catch-up with the parental units totalled 8 minutes. Over the course of a month, I doubt I'd manage to spend more than 30-45 minutes actually talking to people, which would keep me well within the Basic 200 allowance. During my week with FreedomPop, I also didn't send a single text message. For all non-verbal correspondence of that nature I use WhatsApp, which is tied to my primary phone. I did, however, get away from my desk more often than I usually do during the week, which is when I really started to ramp up my data usage. Interspersed throughout the week were a couple of days I barely used my phone at all. When I was out and about, however, typical usage comprised checking emails, some light browsing (mostly looking up train times), a lot of navigation and the real killer: streaming Spotify. In total, I managed to use 450MB of data during the week. Spotify was responsible for the vast majority of that -- 374MB to be exact -- and if I continued my reckless streaming habits, I might get through close to 2GB of data in a month. Exceeding the Basic 200 allowance by 250MB would've cost me £3.75 in overage charges, and by crude extrapolation, £27 for the month. For reference, FreedomPop's overage charges are 1.5 pence per megabyte on the Basic 200 plan, and 1 pence on any of its paid tariffs. Since it's also a data-only service (i.e. voice calls are actually VoIP calls), these charges also apply when you go over your minute and text allowances. If I was being sensible, I'd never actually end up paying £27 per month, of course. I'd purchase a premium subscription to Spotify for a tenner and take advantage of offline listening, but that's just how the week panned out for me. I have a 4GB allowance on my IRL phone contract, and since I don't use heaps of data on other things, I never need to worry about hitting the limit. Saying that, I did actually purchase a FreedomPop SIM (for £7 with activation and delivery) before being approached about a trial. I intend to keep it in my wallet for emergencies, but if I took Spotify out of the equation, I could probably get by using FreedomPop exclusively without racking up a sizable overage bill. This is just my experience, mind, so if you're thinking about making a committed move, you might want to monitor your own typical usage for a week, or a month. Remember I didn't use WiFi at all, so if you're clever about it, you might come to the conclusion you don't need to eat through a whole lot of mobile data either. Because FreedomPop is a data-driven affair (piggybacking on Three's network), all calls and texts are handled by the provider's Android and iOS apps, rather than your phone's core services. 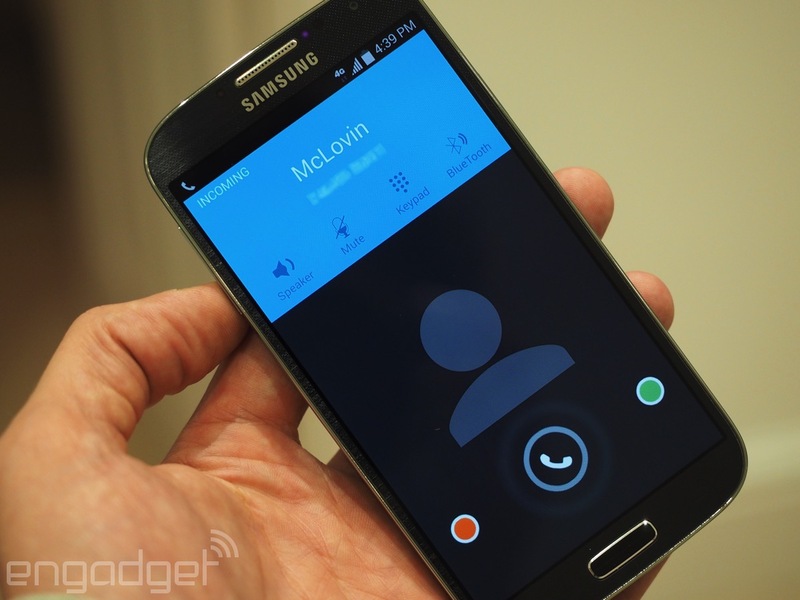 On the Galaxy S4 I tested the network on, you are able to integrate FreedomPop into the native dialer for calling out. When you receive a call, though, it comes through the FreedomPop app tucked away in the background (after a few seconds of lag, anyway). The app itself, which you still hop into to send texts, lets you see your allowances and usage at the prod of a virtual button, which is perfect for freeloaders trying to make sure they don't incur overage charges. Through the app's sidebar, you can also see any of FreedomPop's services you currently subscribe to. If you'd like to add/cancel these or change your plan, though, you're sent to a relatively clunky mobile site. It's not obvious to the user, but FreedomPop pipes calls through a VoIP system, not a traditional cellular network, and this has a noticeable impact on audio quality. Calls sometimes take a second or two to connect, and when they do, there's always something not quite right. Occasionally, you hear an echo of yourself, or the person on the other end of the line morphs into a crackling mess for a second -- something you might have experienced on Skype and similar services. This is true for both parties, with sketchy audio quality and glitches reported by those I've called. This was true even with the £1.99 per month Premium Voice package enabled on my test account, which promises to increase call reliability on weak connections. To be fair, the audio quality issues are relatively minor, and since I rarely make lengthy phone calls, they didn't keep me from going about my business to any great extent. 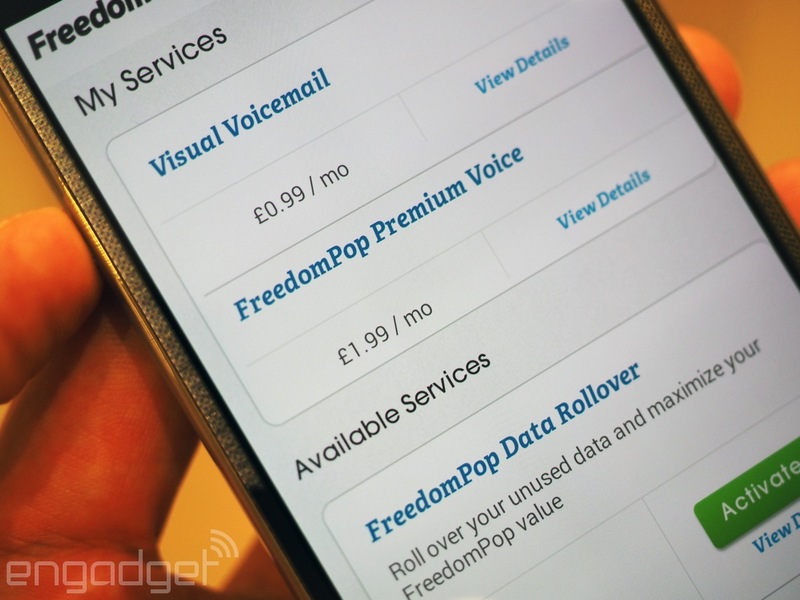 In terms of other extras, FreedomPop offers visual voicemail for £0.99, data rollover for £1.49 and usage alerts prior to hitting your limits for £0.99 per month. 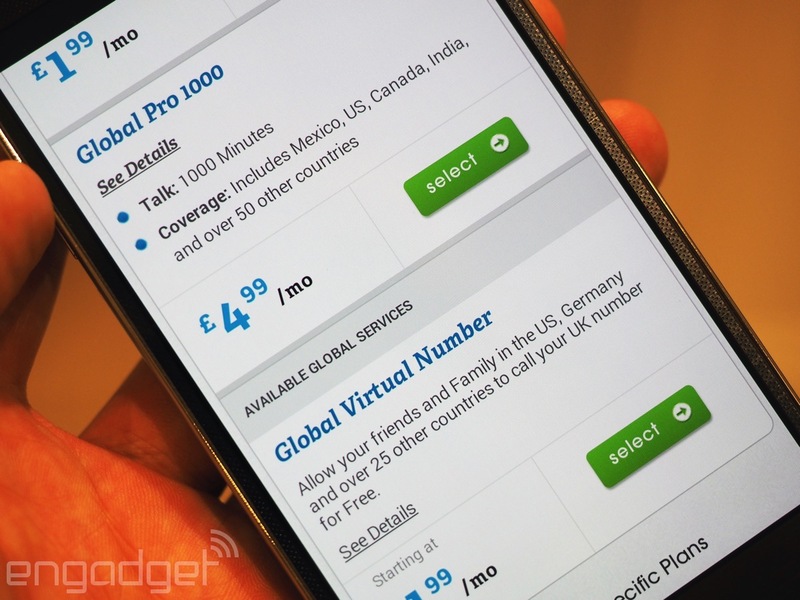 Starting from £1.99 per month, you can add another virtual number to your account so friends and foes from other countries can call you at local rates. You can add international calling minutes to your account for a monthly free, too, starting at £0.99 for 100 minutes, up to £4.99 for 1000. If you're dead set on squeezing the most out of the "Basic 200" plan, FreedomPop allows you to earn free data in a couple of ways. Referring a friend banks you a measly 10MB, but you can potentially earn up to 2GB each month by filling out surveys, downloading coupons, signing up for free trials and the like. It's supposed to work like that, anyway, but at the time of writing, there were no offers available for me to check how bothersome they might be (FreedomPop's still sourcing partners, it seems). It's worth noting that the offers page is one of the only parts of FreedomPop's website that isn't mobile optimized, so it might be even more of a chore filling out a survey from your phone in a pinch. If you've got a bunch of friends also on the network, you can share data between each other, in case one of you wants to take one for the team and spend a lazy Sunday downloading coupons. 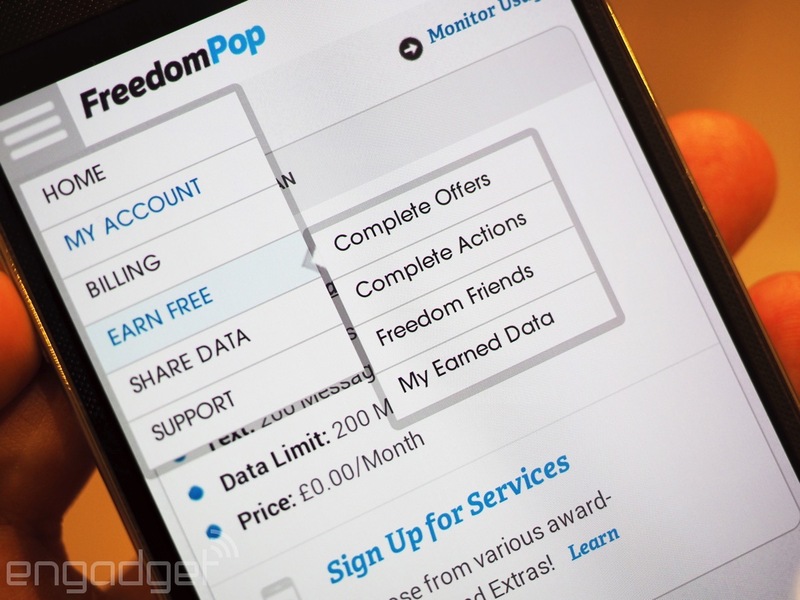 FreedomPop's just starting out in the UK, but it has promised to add more "compelling plans and services" in the future. In the US, where FreedomPop has been operating for a couple of years now, the provider offers subsidised devices, and has just announced a partnership with Intel to produce a phone tailored specifically for its virtual network. The main draw of FreedomPop is obviously its free basic tariff, but if you want to keep yourself a little further away from overage charges, a trio of cheap "Premium" SIM-only plans are also on offer. Premium 500 -- £4.99 per month -- 500 minutes and texts, 500MB of data. Premium 1GB -- £8.99 per month -- 1000 minutes and texts, 1GB of data (Premium Voice included). Premium 2GB -- £11.99 per month -- unlimited minutes and texts, 2GB of data (Premium Voice included). By all accounts, an extremely competitive selection -- as long as you're alright with patchy call quality -- especially since they're available on rolling 30-day contracts. The benefit of going Premium is you're also eligible for lower overage charges, at 1 pence per megabyte compared with 1.5 pence on the Basic 200 plan. Having used FreedomPop for a week and looked into its paid services and plans, it's clear to me the new provider isn't trying to take anyone for a ride. Apart from some minor call quality issues, I never had a problem with signal -- though I wouldn't have expected any on Three's network in the London area. When you order a Basic 200 FreedomPop SIM, you have to pay attention to the checkout process, as you need to opt-out of some of the additional paid-for services it tries to sign you up for by default. When you actually receive your SIM, though (whenever that may be), you are getting a truly free mobile service. The overage charges are by no means extortionate, too. You can easily check your usage and remaining allowances through the FreedomPop app, so it's not like it's geared to hide that information from you until you receive a hefty bill. FreedomPop's service is obviously meant for light users, not haphazard streamers like me. If I was a bit smarter with my data usage, however, I could almost certainly get by on the free tariff with minimal overage charges, and unless your phone is in-hand 24/7, you might realise you could too. While I'm sure there are many of you, like myself, that are happy to keep a free SIM to hand for emergency use, the provider's "Premium" plans are also great value for money as far as 30-day, SIM-only offerings go. 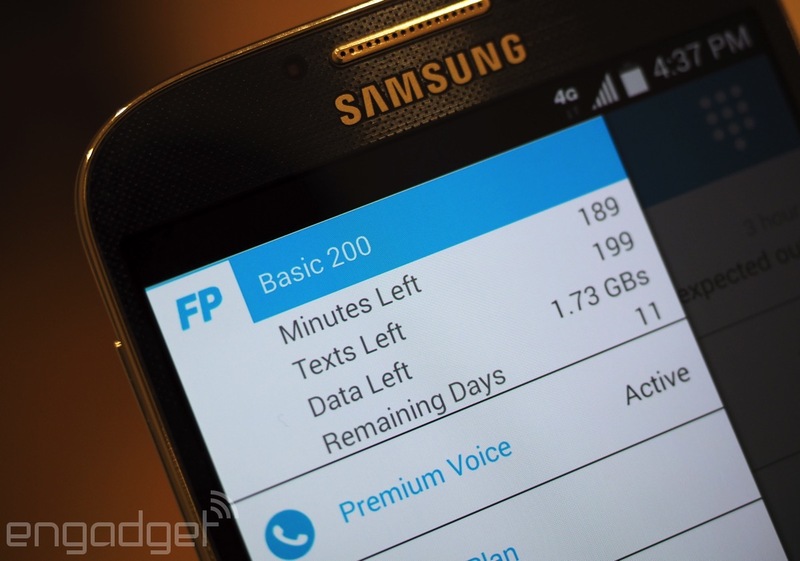 I'm extremely interested to see how FreedomPop evolves over the coming months. If and when it starts getting into subsidised handsets, it might well become a seriously attractive alternative to the UK's major carriers and MVNOs.